When it comes to purchasing fish or other livestock for a saltwater aquarium, the first thing you need to understand about the animals is their compatibility. In other words, why they act as they do towards one another. Whether choosing a fish-only tank or a reef system, without knowing about a particular animal's ability to reside peacefully or not with other tank inhabitants can quickly lead to disaster. There are five basic categories of aggressive behavior. Any particular fish can be either the instigator and/or the recipient of one or a combination of these behaviors. 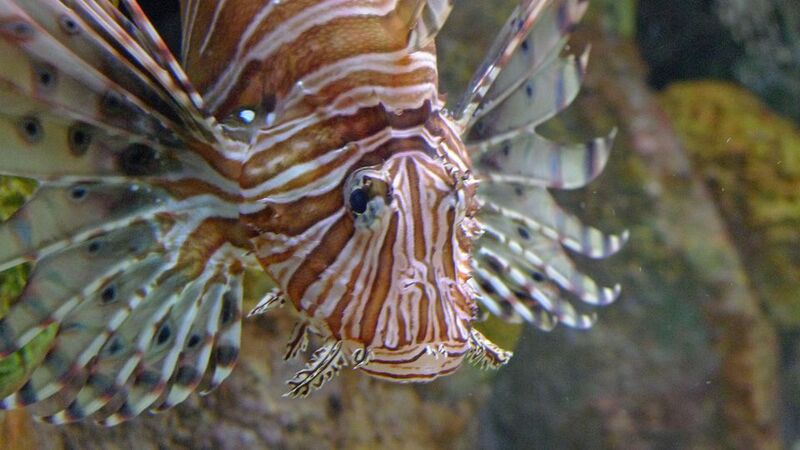 For example, a pair of Damsels may instinctively try to defend their nest from a Volitans Lionfish while trying to keep from being eaten themselves. The recipients of this type of aggressive behavior are perceived as food organisms, such as a Moray Eel consuming an ornamental shrimp or a Lionfish consuming a small Damselfish. Keeping larger predatory fish with anything small enough that they can perceive as food is not a wise idea. Many aquarists choose to keep these types of fish in a specific predatory tank community, with fish like large Groupers, Hawks, Snappers, and other predatory species. The recipient of this type of aggressive behavior are others of the same or similar species, such as a juvenile Angelfish and Jewelfish attacking others. When it comes to territorial aggression, most fish react in the same way, especially when you already have fish established in an aquarium and you add in a new tank mate later on. When you place all new fish into an aquarium at the same time, a few disputes will occur until territories are established. Once that is done, the fish usually settle down and life goes on. The problem of "harassment" will most likely occur whenever you put a new fish into an established aquarium community, and most often it doesn't seem to matter what type or species of fish it is. The recipients of this type of aggressive behavior are other fish of the same species, such as a mated pair of Clownfish attacking others. It is interesting that most species exhibit this type of behavior. For example, if you put a mated pair of Angelfish, Butterflyfish, Boxfish, or just about any other type of mated species in a tank, and then add another male or female of the same species later, typically the same-sexed fish will go after the same sexed fish that was newly introduced. Limiting a tank to one specific mated species is wise. Providing ample housing and plenty of room for the fish to move around or get away from each other is important as well. The recipients of this type of aggressive behavior are all other fish near a nesting area, such as Damselfish protecting their spawn from other fish that may stray into their nesting area. It helps to keep fish that spawn in captivity in larger sized aquariums and provide ample housing not only for the nesting species but all the other tank inhabitants as well. The recipients of this type of aggressive behavior are all other fish and invertebrates. A good example of this behavior is Triggerfishes, which will eat just about anything. Fish that have this type of behavior are best kept in a specific aggressive species tank community. Many times aquarists will keep Triggers with other Triggers, as well as Lions, Groupers, Hawks, Snappers, and other larger predatory species. To help quickly determine which fish "should" get along refer to the Saltwater Aquarium Fish Compatibility Chart. Keep in mind that there is always a rebel that doesn't get along with anything.